Thanks for the review. And if you love Doris Day. You should check out 'Pillow Talk' if you havent seen that one. I think you would enjoy that one. Thanks Piffi, but as I said, I've got pretty much every DVD with Doris Day that I have been able to find. "Pillow Talk" is a double dip, both DVD and Blu-Ray. Actually probably a triple dip, because I'm pretty sure I had it on VHS before I chucked all those out. And yes, it's very good. One of her best. Nice. I'll just ask. Whats your favourite Doris movie of all time? I too am a big Doris fan. But i dont have so much movies of her yet. Favorite Doris Day movie? Ouch, I'm really not good at weighing movies against each other, so I'm definitely not a list maker. That said, I have a soft spot for Calamity Jane and The Pajama Game. Pillow Talk, Please Don't Eat the Daisies, That Touch of Mink, Thrill of it All and Move Over Darling. The last two with James Garner are probably my favorites but the other 3 are pretty fun . Oh, now you've done it, David! You mentioned two of the films that's missing in my DD collection; Please Don't Eat the Daisies and The Thrill of it All. Now I've got to go out and hunt for them again. I've seen them, of course. I think TCM has shown both of them. They aren't really among my most favorite DD movies, but that doesn't mean that I can overlook that they're missing in my DVD collection. 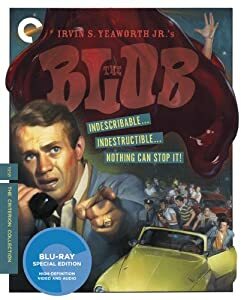 Director Irvin S. Yeaworth, Jr.
Overview A CULT CLASSIC OF GOOEY GREATNESS, The Blob follows the havoc wreaked on a small town by an outer-space monster with neither soul nor vertebrae, with Steve McQueen playing a rebel teenager who tries to warn the residents about the jellylike invader. Strong performances and ingenious special effects help The Blob transcend the schlock sci-fi and youth delinquency genres from which it originates. Made outside of Hollywood by a maverick film distributor and a crew whose credits mostly comprised religious and educational shorts, The Blob helped launch the careers of McQueen and composer Burt Bacharach, whose bouncy title song is just one of this film's many unexpected pleasures. My thoughts I briefly considered comparing this to the 1988 remake, but I quickly realized that it would be totally unfair. The remake had a vastly larger budget and 30 years of technical advancement behind it. I think you have to look at a film like this with some degree of nostalgia. I love old fifties B-movies, much because of the simplicity with which they were made. It's a little bit like watching a theater performance. You have to let your imagination fill in what the production cannot show. Maybe this is something that the younger audiences have never learned, being fed on megabucks CGI effects? Anyway, The Blob is Steven (sic) McQueens first starring movie role (not his very first movie role as sometimes has been claimed). At 27, he is really way too old to play a teenager, but he gives a good performance, giving us at least a glimpse of what is to come in his career. The film focuses a little too much on the teenagers vs. the unbelieving adults (especially the police) and too little on the title menace. The blob effects may be simple, but for its time quite inventive. The ending is a bit of a letdown, as in so many of these fifties movies. You find that the monster has a weak spot, and voila – monster defeated, film over. Dramatically not very satisfying. Some reviewers see a communist subtext in the film. Some reviewers see subtexts in everything. Personally I subscribe to the sometimes-a-spaceship-is-just-a-spaceship theory (meaning that not every spaceship is a phallus symbol, not that here is a spaceship in this movie), and sometimes a monster threatening to take over a small town is just a monster. In the final analysis, this isn't a terribly good movie, but it has an undeniable charm. If you belong to the generation that grew up with Famous Monsters of Filmland, you'd probably like it. For those “youngsters” who missed out on that, well, the 1988 remake may perhaps be more satisfying (but give this one a chance anyway). Regarding the Blu-Ray release, I can honestly say that this is the best this movie has ever looked on home video. It has two commentary tracks, which I presume are the same as on the DVD. Yeah, I think for some of these films you just had to be there. Saturday afternoon at the local theater (really small town with a smaller theater) had great films. The Mid-Late 50's and Early 60's (though I was starting to get jaded by early 60's) had great films that to this day I still love (well probably the memory .. sometimes seeing them isn't quite a wonderful ). 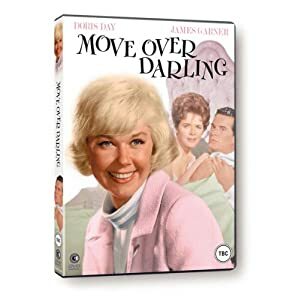 Overview Move Over, Darling is a wonderful romantic comedy starring screen legend and number one box office star of the time, Doris Day. Five years after his wife Ellen (Doris Day) disappears in a plane crash, lawyer Nick Arden (James Garner) declares her legally dead. He embarks on a new life by marrying wife number two Bianca and the newlyweds set off on honeymoon. On the same day Ellen, having been rescued from a desert island by the Navy, arrives back home to be told the news. She immediately heads for the happy couple's resort where things are about to get complicated. Nominated for a Golden Globe®, Move Over, Darling is a delightful fast-paced comedy romp starring one of the most popular and successful American superstars of the post-war era. My thoughts My Doris Day marathon continues. This time with a remake of the 1940 comedy "My Favorite Wife" that starred Irene Dunne and Cary Grant. If you're looking for a Doris Day musical, look somewhere else. Apart from the title song over the opening credits, the only time you'll hear Doris sing is when she sings a lullaby to her children. The original is really a better film that this one, so unless you're a Doris Day fan, you're better off watching "My Favorite Wife". But then again, everyone is a Doris Day fan, right? A truly wonderful supporting actress. Often nominated for an Oscar, but never a winner. Shame on you, Academy of Motion Picture Arts and Sciences! During her career, Ritter was nominated for an Oscar six times, giving her the distinction of being one of the three actresses (tied with Deborah Kerr and Glenn Close) most nominated for the award in an acting category without a win. The current record for all actors is Peter O'Toole with eight nominations without a win, followed by Richard Burton with seven nominations. Both Kerr and O'Toole received honorary awards from the Academy, however. In 1954, Thelma Ritter co-hosted the Oscar ceremony, notably trading wisecracks with Bob Hope. She was always a hoot. She was wonderful in How the West Was Won and the funny Hole in the Head. She was wonderful in How the West Was Won and the funny Hole in the Head. The "How the West Was Won" Blu-ray comes with "smile box" version (at least the US release), kind of neat. It's not really a very good film, as there is too many threads going on and not a straight though-line, but it is a guilty pleasure of mine and always a fun watch. To avoid hijacking I branched further discussion off to here. Great reviews Gunnar. A couple added to the wishlist (Ray Harryhausen things in particular). A TV show you might like is Hollywood Treasures. It follows an auction specialist company as they track down and sell movie memorabilia and there are some fantastic episodes with Golden Age gear. 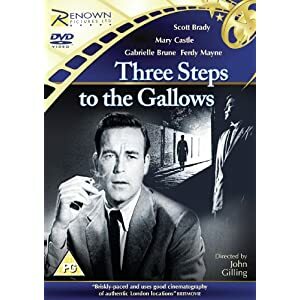 Overview Made in 1953 and directed and scripted by John Gilling, this Tempean Production is a great piece of 1950’s crime drama. American cargo ship Officer Stevens (Scott Brady), finds out that his brother is the frame-up victim of a smuggling gang and is due to be executed for murder. In order to clear his brother’s name, Gregor becomes acquainted with nightclub performer Yvonne Durante (Mary Castle) and her diamond-smuggling associates. Can Stevens save his brother and bring the criminals to justice? Also starring Ferdy Mayne with some excellent 1950’s London Locations. My thoughts What's Rita Hayworth and the major from Faulty Towers doing in a an old British crime drama from 1953? Oh, wait, it isn't Rita Hayworth. It's Mary Castle. But by George, she looks incredibly like Rita Hayworth. And as for the major, well it is Ballard Berkeley, but a lot younger, of course. Still, quite recognizeable. It's a case of "who can you trust", and pretty much from the start there is one person where I wondered if he was really trustworth, but there's another that I didn't see coming. There is nothing special about this film, really, but I like these old black-and-white thrillers. And I have always loved London, so it's always fun to see films that are shot in real London locations. Good old Ferdy Mayne is in there, too, but ever since I say "The Fearless Vampire Killers" I always expect to see fangs.